Between 2013 and 2017, France surpassed the United States as the top provider of arms to Egypt, providing almost 4 billion euros in supplies. 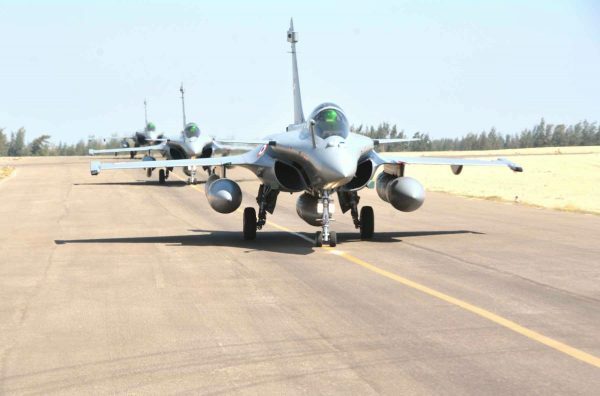 This shift reflects major sales by France, including a deal to deliver 24 Rafale jets in 2015. Between 2013 and 2017, several European countries—most notably France and Germany, along with Russia—have provided Egypt with over $4.2 billion in arms sales. This was a drastic change in arms sales when compared to the time period between 2008 and 2012, during which European countries sold $906 million in arms. The sales of arms to Egypt has yielded backlash, particularly given European countries’ perceived silence and relative inaction on human rights abuses and repressive measures in Egypt. Europe has dramatically increased its arms sales to Egypt over the past five years. In Germany, despite criticism from leftist German parties on the sale of arms to governments that commit human rights abuses, arms sales to Egypt increased by 205 percent between 2013 and 2017, as compared to the period between 2008 and 2012. French arms sales to Egypt have also followed a similar upward trend, surpassing for the first time even U.S. arms sales over a five-year period. Notably, in April 2016, France and Egypt signed an arms deal that includes Rafale fighter aircraft, Mistral-class navy vessels, and a military satellite system, part of larger set of agreements regarding energy, defense, and security that are valued at $2.26 billion. Over $1.2 billion in arms agreements have been made between Russia and Egypt during 2016 and 2017, and the two countries signed a five-year, reciprocal arrangement in November 2017, allowing Russian military planes to use Egyptian military bases and air space. In the past decade, global arms markets have changed significantly. Whereas major Western European arms dealers once sold almost exclusively to NATO allies and other European states, they have now shifted their focus to the Middle East and North Africa. Since 2012, the global arms market has not grown in agreement or delivery values, and thus the increased competition to dominate the market has made MENA an attractive target market. In the period between 2013 and 2017, Egypt was ranked the second largest recipient of arms transfers in the Middle East behind Saudi Arabia, largely because of purchases from Western Europe. While the U.S. and Russia have maintained their dominance of global market share, Western Europe has increased its share dramatically. Between 2014 and 2016, Western European arms dealers (mainly France, Italy, Germany, and the United Kingdom) increased their sales from 9 percent of the market to over 25 percent. France alone has had the largest value increase in global weapons agreements, making it the third largest arms exporter in the world, behind only the U.S. and Russia. But the sale of weapons to MENA countries, including Egypt, has also caused backlash. Human rights groups such as Amnesty International have alleged that the sale of military and policing arms to Egypt make their sellers complicit in unlawful killings, forced disappearances, and torture. Because of media and monitoring restrictions within the country, it is often difficult to evaluate the end use of specific materiel. However, there have been confirmations of the Egyptian military and police forces using U.S.-manufactured F-16 fighter jets, Apache helicopter gunships, tanks and other personnel carriers, and pistols and rifles, including in operations that have resulted in civilian casualties. The use of U.S.- and U.K.-manufactured tear gas, as well as Italian-manufactured bullets, against protesters has been extensively documented. Additionally, a recent report by Amnesty International details the use of French-supplied Sherpa and MIDS armored vehicles during the August 2013 Raba’a al-Adaweya sit-in dispersal. In 2013, the European Union enacted an arms embargo on Egypt to combat “internal repression” and extreme violence in the country; the embargo was reaffirmed in 2014. Then, in 2016, in the wake of the suspicious and brutal murder of Italian student Giulio Regeni, the European Parliament passed a nonbinding resolution that called for the cessation of security cooperation of any kind. Since then however, 12 of 28 E.U. member states, most notably France and Germany, have continued to sell small and large arms to Egypt. The growing sales between Europe and Egypt can be read both as Egypt diversifying its arms sources and Europe’s need for markets in the Middle East. In the case of the former, Egypt is searching for alternative streams of military financing beyond the U.S., particularly given the strained relationship that occurred under President Barack Obama, who temporarily stalled the delivery of F-16 fighter jets and Apache helicopters (and suspended Bright Star military exercises). Although cold relations have thawed under President Donald Trump’s administration, members of Congress, and particularly those in the Senate, have become increasingly critical of the $1.3 billion in military aid that flows to Egypt annually. This has precipitated in the form of holds by Senate appropriators and legislation that increases the percentage of military assistance that is contingent upon Egypt’s compliance with democracy and human rights conditions. Egypt has found more than willing suppliers in Europe and Russia. Most European countries readily view sales as positive for the domestic revenues that they generate. As noted, the Middle East has rapidly increased its purchase of weapons, becoming a new and welcome market for the defense industry worldwide, and Egypt is no outlier. Particularly in the case of Russia, the strengthening of relations with Egypt not only provides revenue to supplement an economy that has been struggling as a result of U.S. sanctions, but relations also yield gains in regional political influence. As Russia seeks to expand its influence beyond Syria and into the broader Middle East, it has looked to Egypt as a strategic ally in the region. For Cairo, although still far from the military strength it once enjoyed during the 1950s, 1960s, and 1970s, the growing relations with countries such as Russia and France have emboldened Egypt to market itself as a key player in the region and on the international stage.